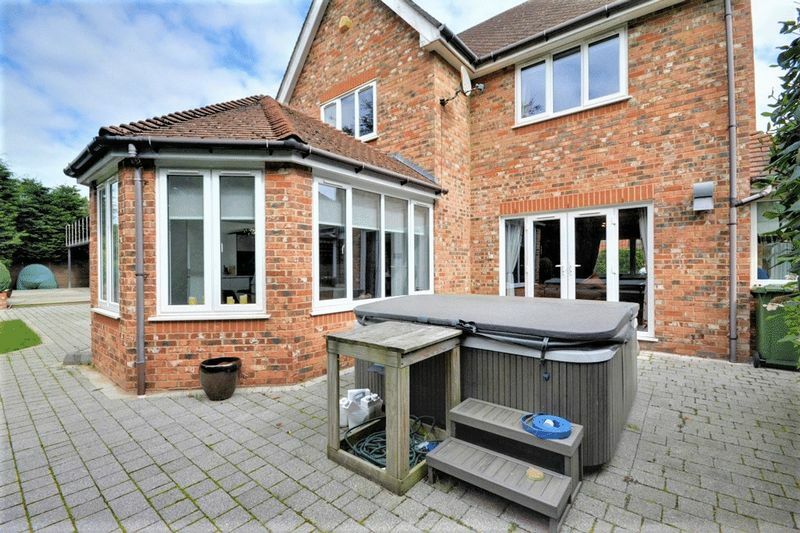 *** MILLIONAIRE'S ROW, FRESHFIELD, FORMBY LOCATION * SWIMMING POOL, JACUZZI AND GYMNASIUM * DOUBLE GARAGE * LANDSCAPED GARDEN * PRIVATE BALCONY * 5 BEDROOMS * MODERN, OPEN PLAN LIVING * QUIET CUL DE SAC LOCATION *** This immaculate, well planned residence has everything to offer a family having undergone an extensive programme of refurbishment. 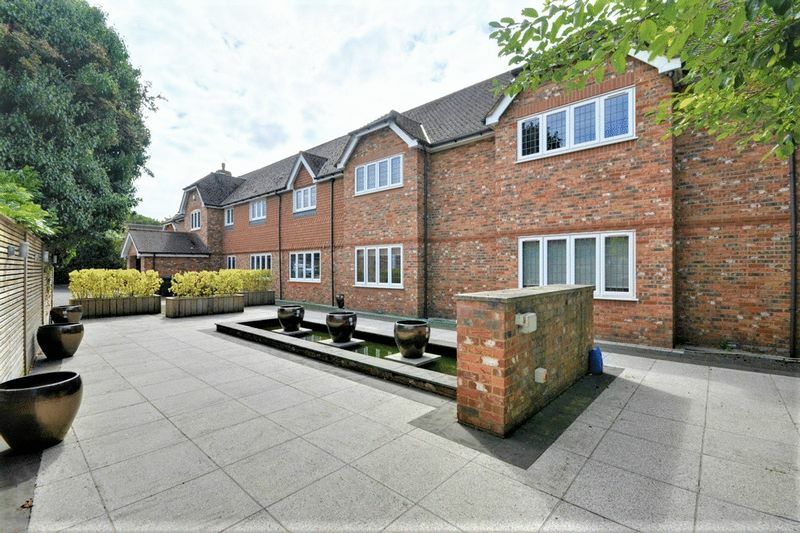 Situated at the end of a quiet cut de sac leading off one of Freshfields most sought after roads, in the highly sought after residential town of Formby, this property is ideally placed to suit all needs. 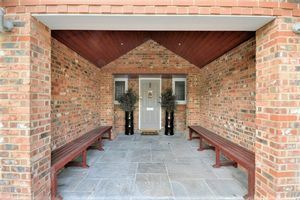 Within walking distance are excellent local schools, the shops, bars and restaurants of popular Formby Village, transport links to Southport and Liverpool via Freshfield Station and Manchester and Liverpool just 40 minutes away by car. 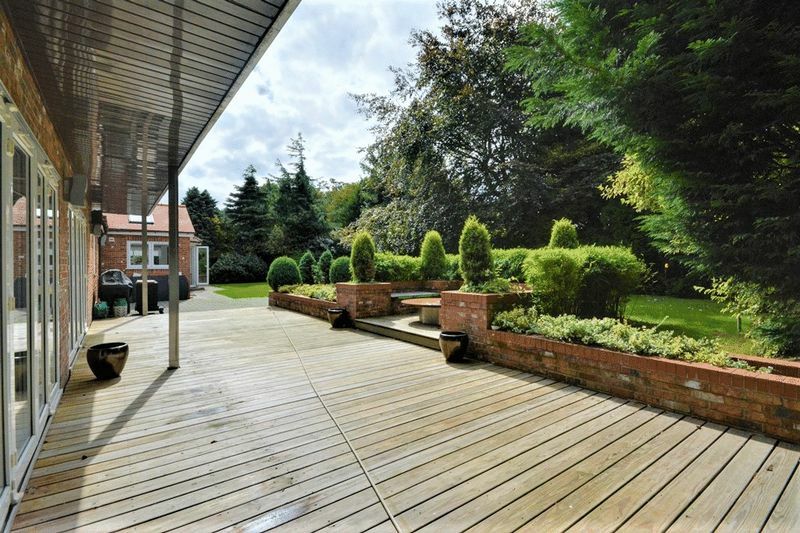 The famous Formby Pinewoods and Squirrel Reserve is on the doorstep, as well as numerous local parks and golf courses including Formby Golf Club, Formby Ladies Golf Club and the exclusive Formby Hall Golf Resort. 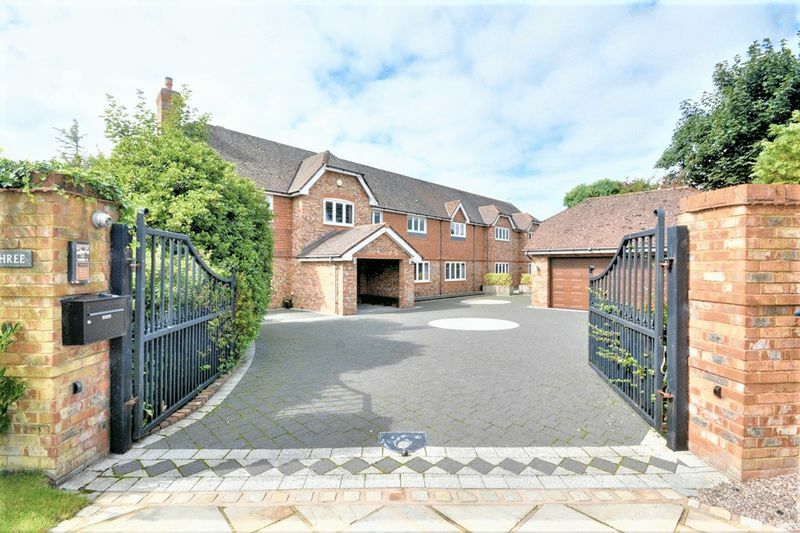 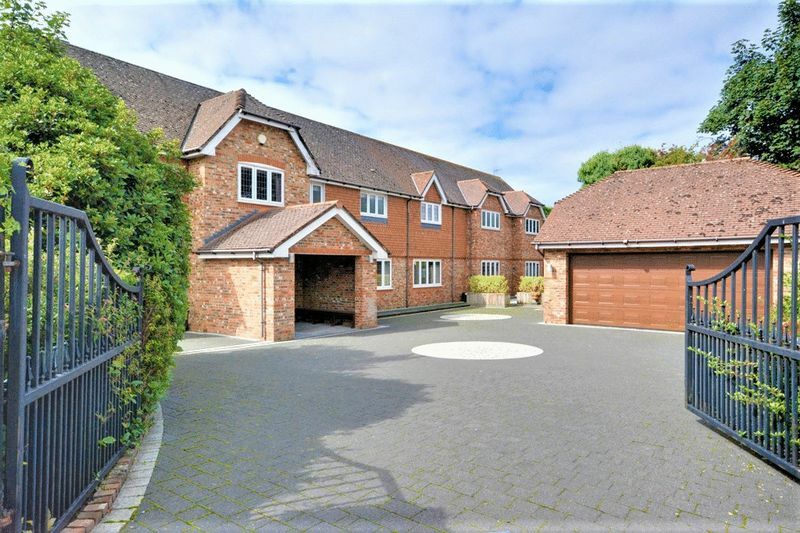 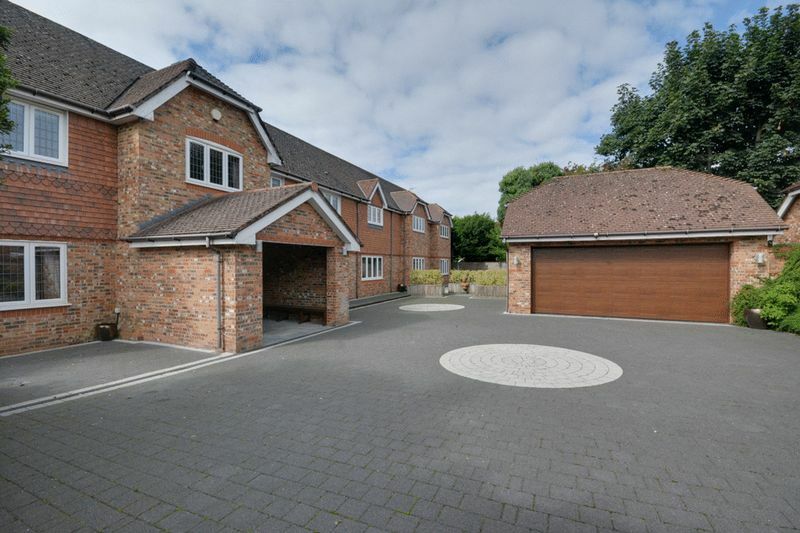 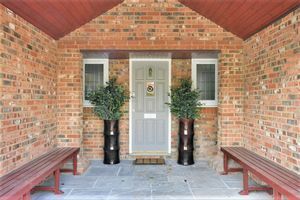 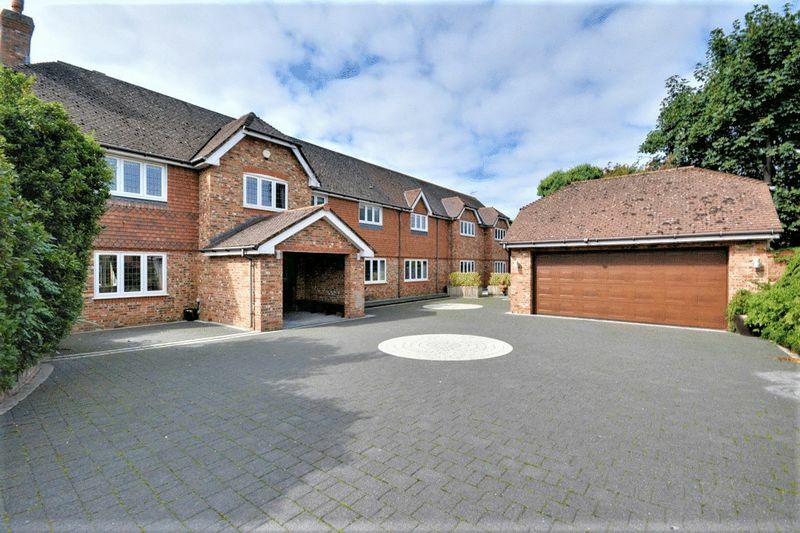 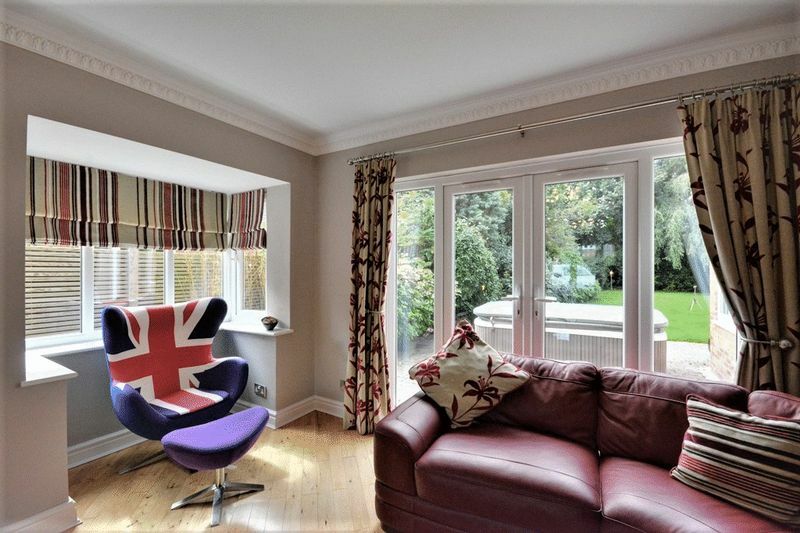 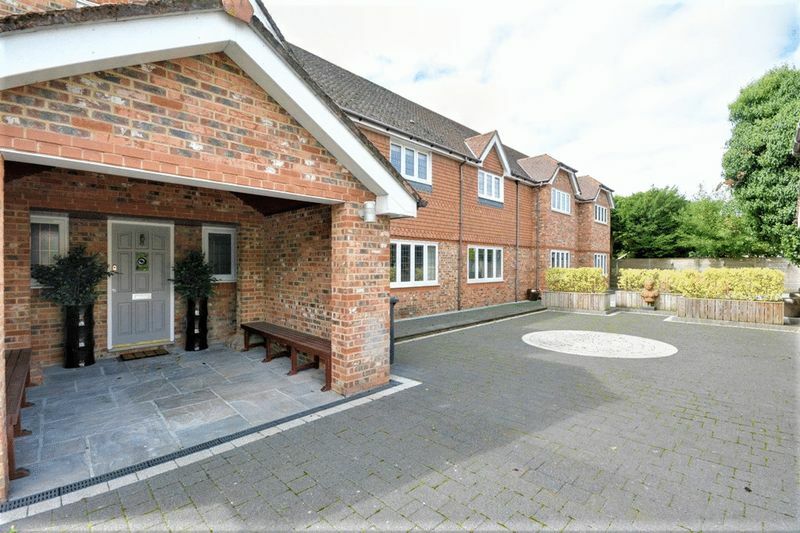 The property is built on a generous plot accessed via secure, electric double gates with telecom entry system onto large driveway providing ample parking for multiple vehicles, complimented by the additional detached double garage. 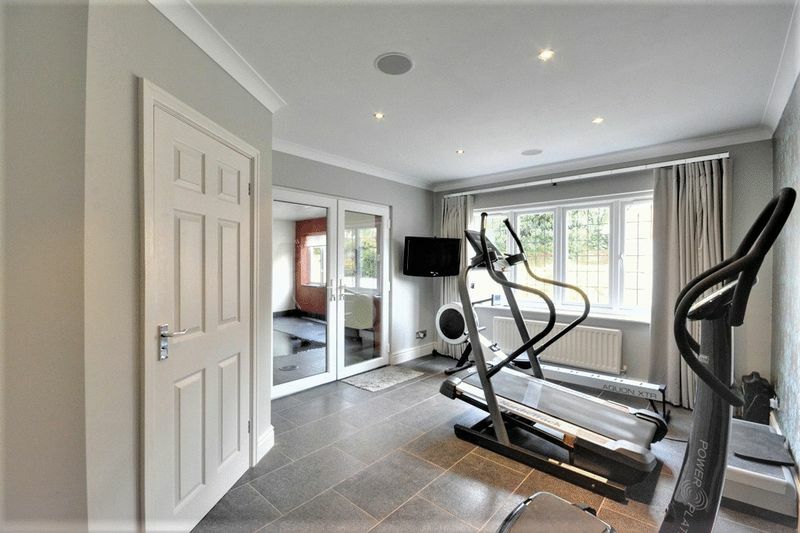 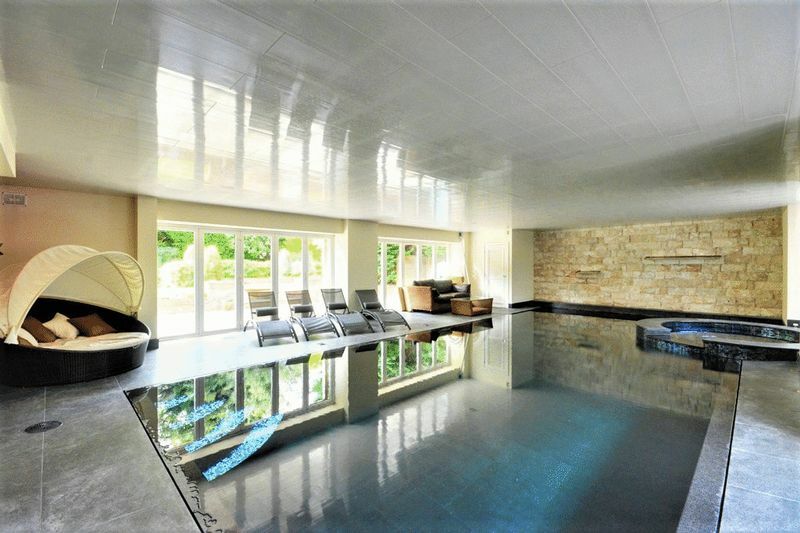 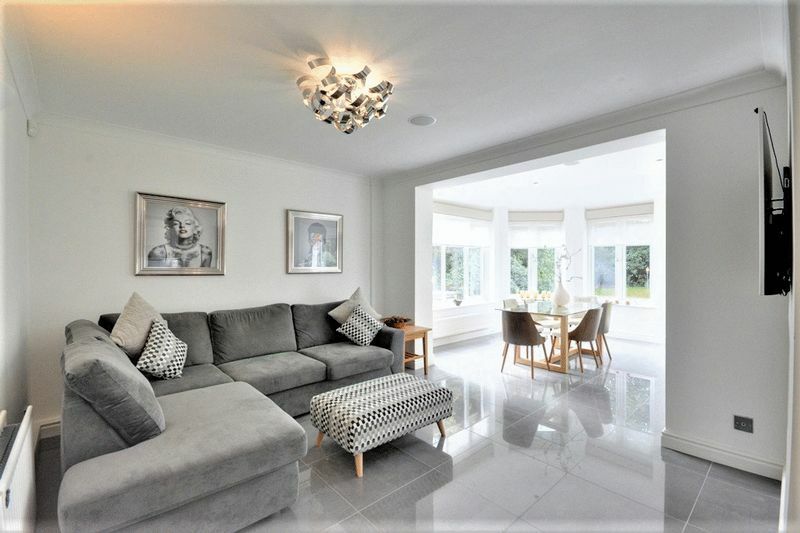 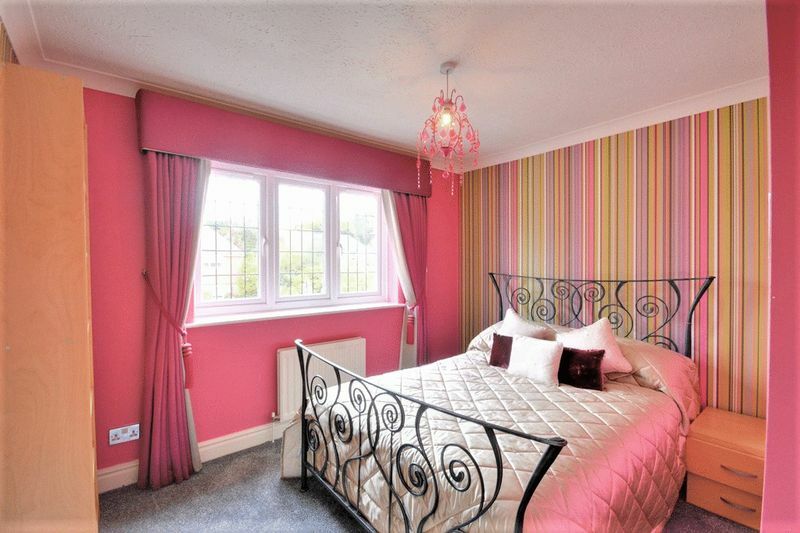 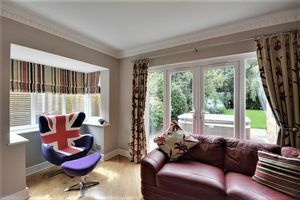 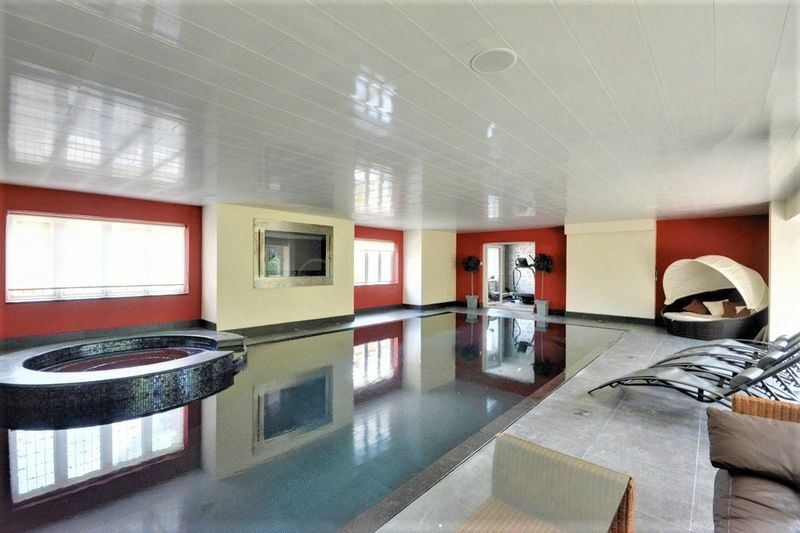 The property briefly comprises to the ground floor; open vestibule, entrance hall, WC, living room, office, sitting room, open plan living area, dining room and kitchen, utility room, gymnasium, WC and swimming pool/jacuzzi to the ground floor. 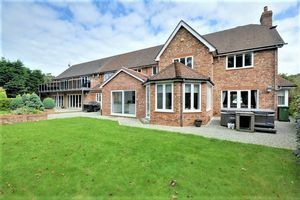 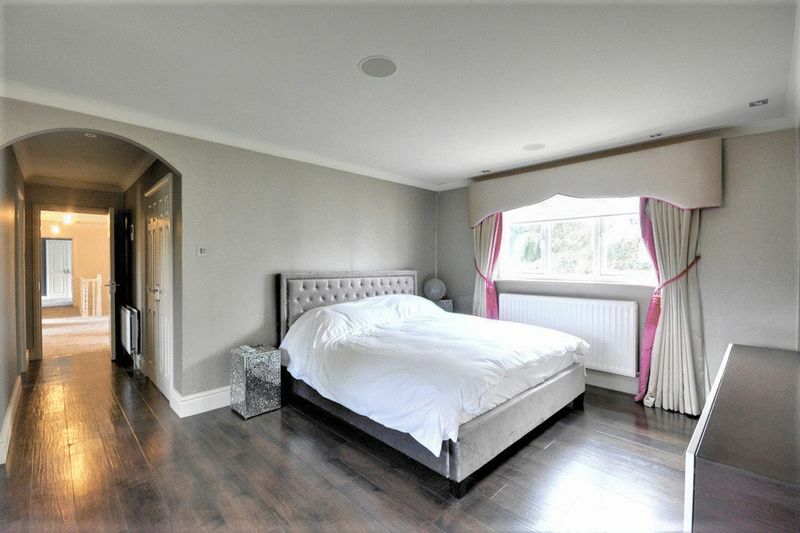 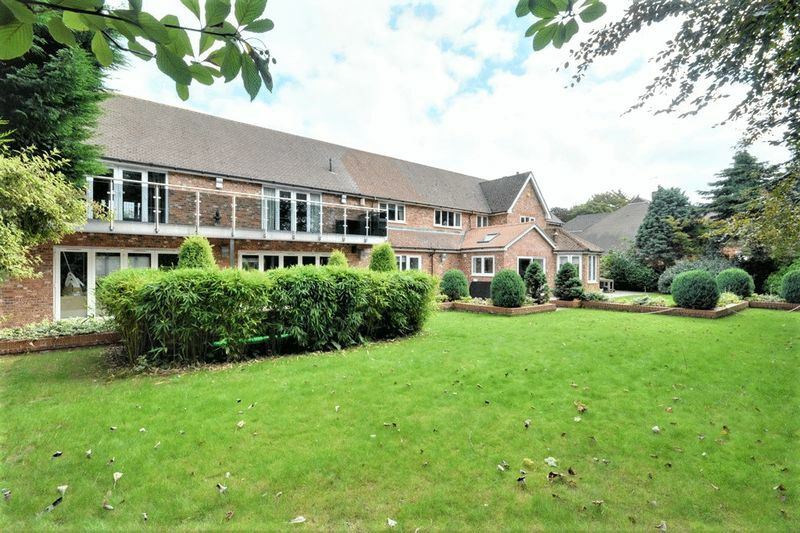 To the first floor is a large master suite comprising master bedroom, dressing room and en suite bathroom, a family cinema room, four double bedrooms, three en suites and an additional family bathroom. 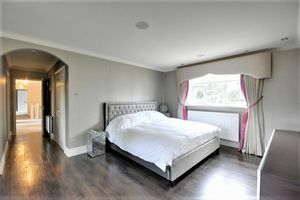 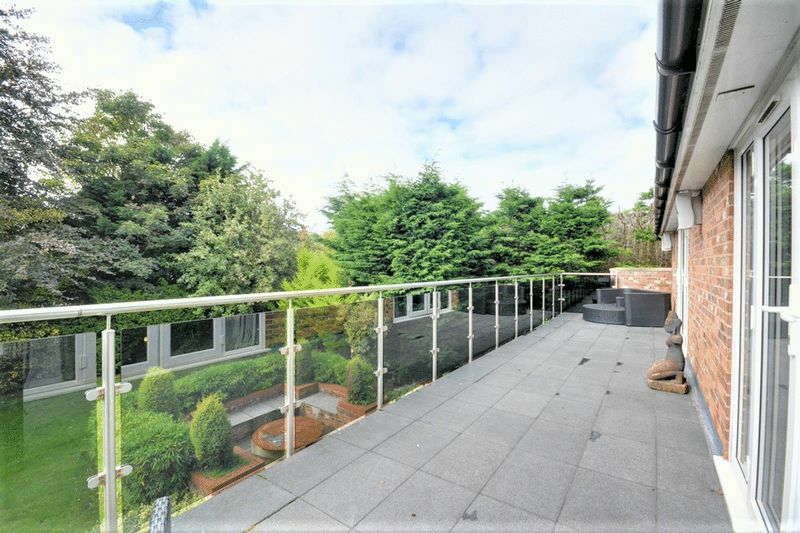 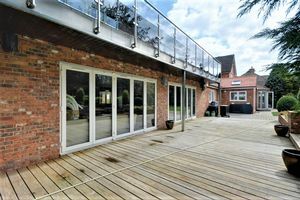 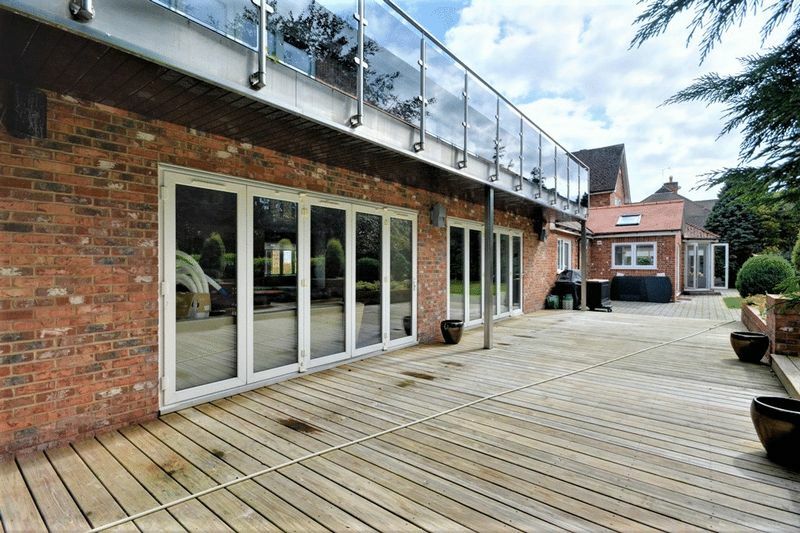 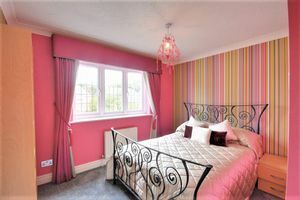 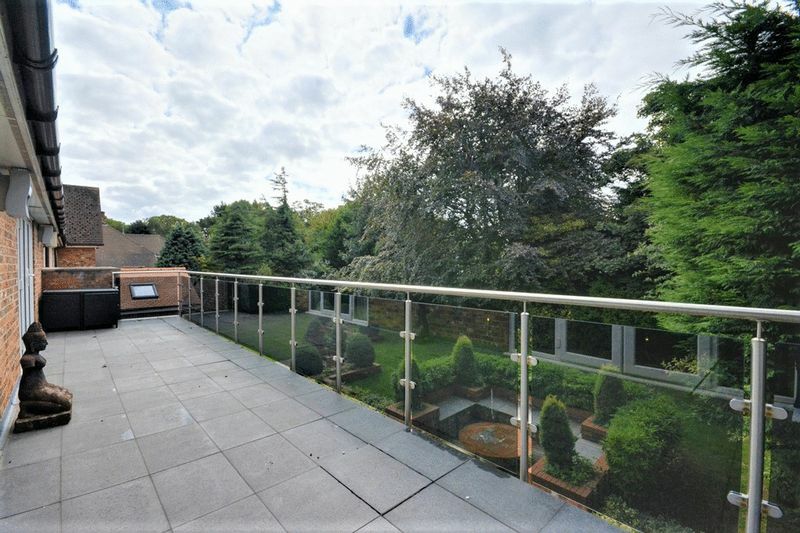 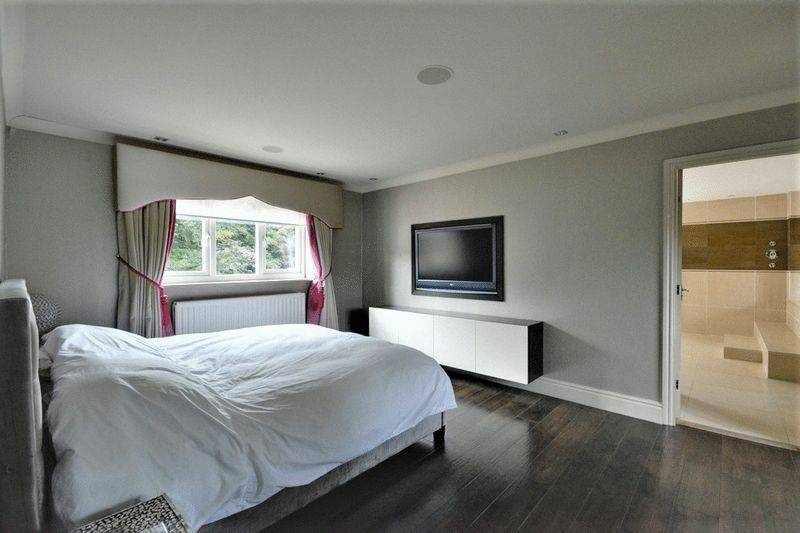 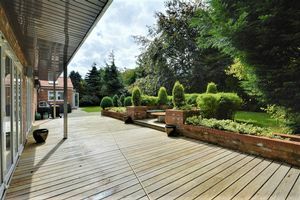 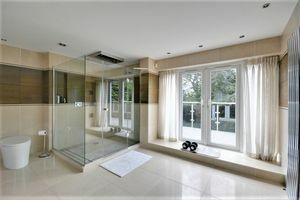 A large private balcony overlooking the landscaped rear gardens is situated off the master suite. Externally, superbly planned landscaped gardens surround the property. 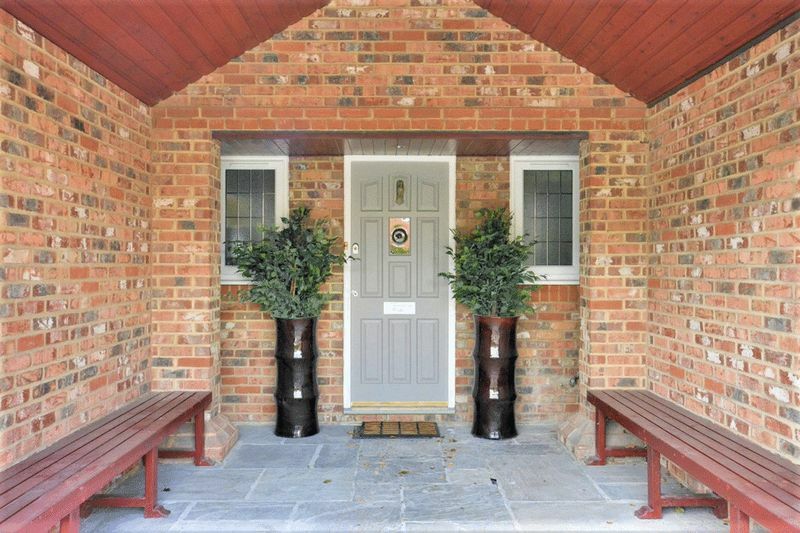 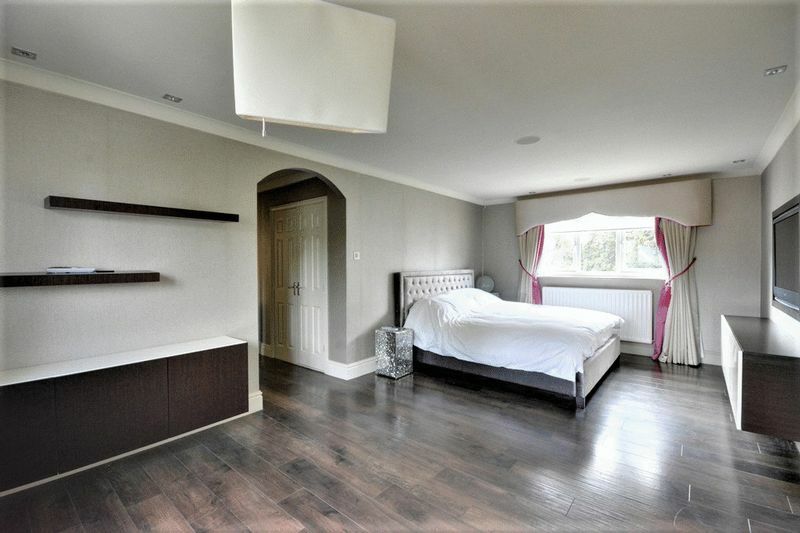 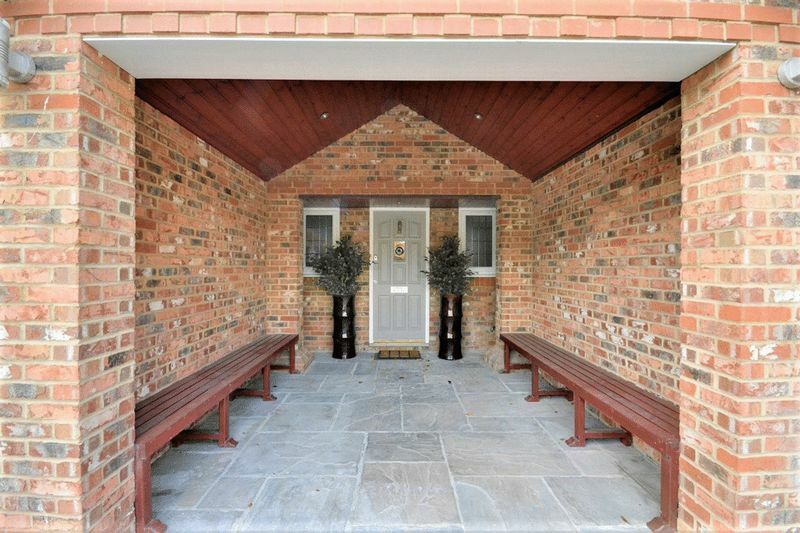 To the front, in addition to the stunning open vestibule, brick paved driveway and detached garage is a further paved garden space with water feature. 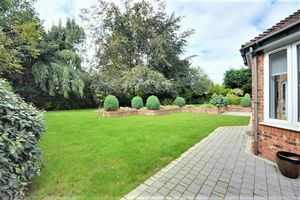 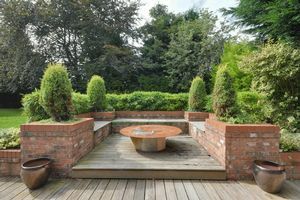 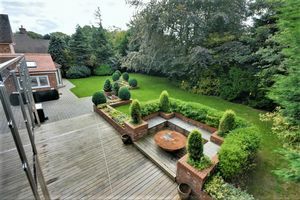 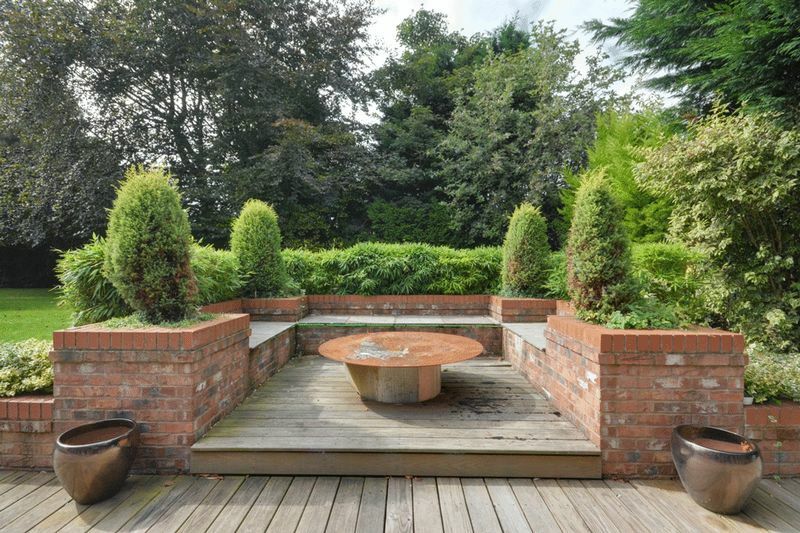 To the rear is an extensive rear garden with lawn, raised, brick decorative borders with plants and shrubbery, brick built fire pit area ideal for entertaining, stone patio area and raised timber decking patio. 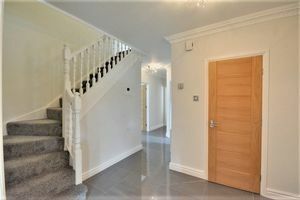 This property is offered with no chain animist be viewed to appreciate the scope of the well planned accommodation and quality of finish. EPC: D.
Entrance hall with tiled flooring, radiator, window to front, double oak doors onto living room and kitchen/living area, oak doors to WC, study and sitting room, understaff storage and stairs to first floor. 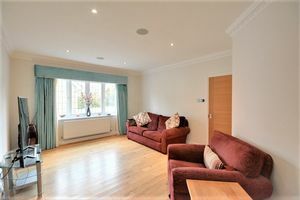 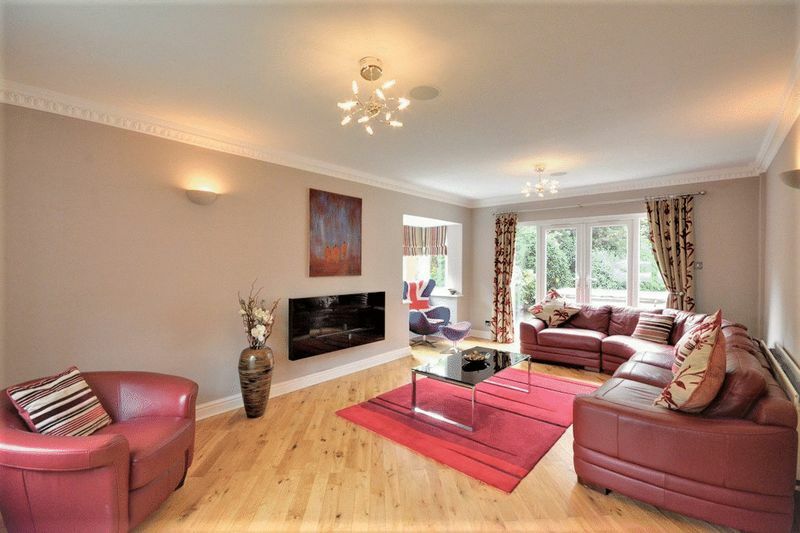 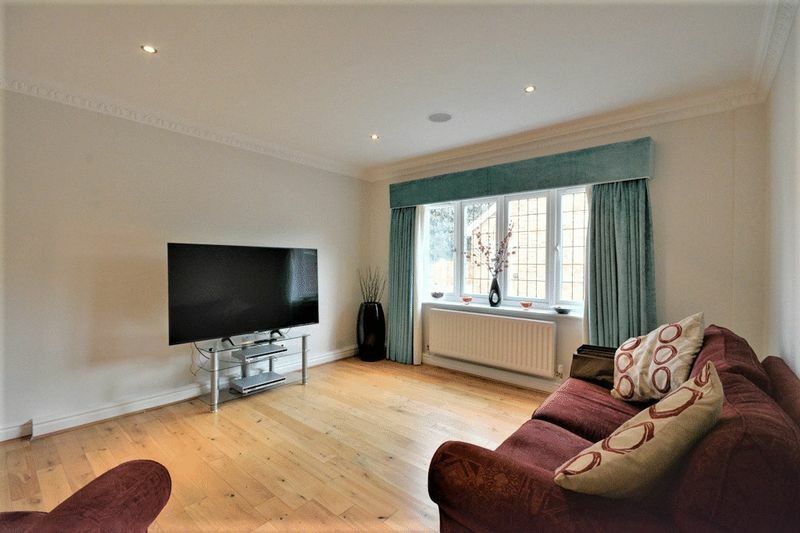 Spacious family room with solid oak flooring, window to front, box window to side, French doors to rear onto patio with matching side panels, radiator to front, wall lights and wall mounted living flame gas fire. 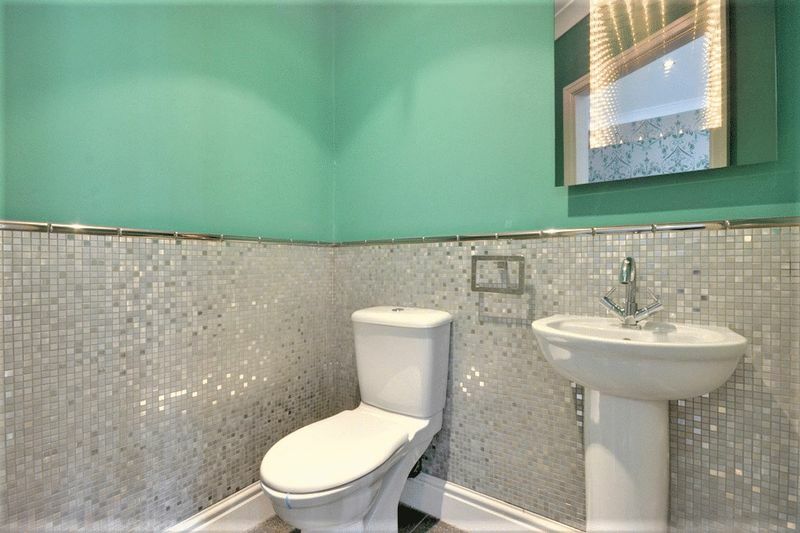 Tiled flooring, partially tiled walls, double glazed window with obscured glass, ladder radiator and two piece suite comprising wash hand basin and WC. 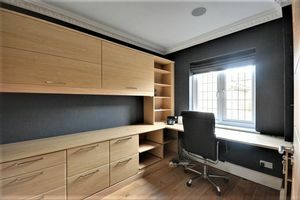 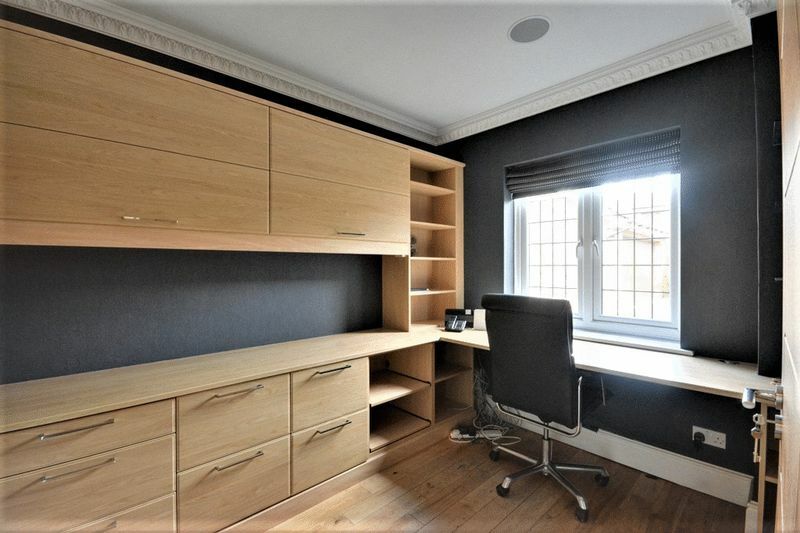 Study with window to front, solid oak flooring and built in desk and storage. 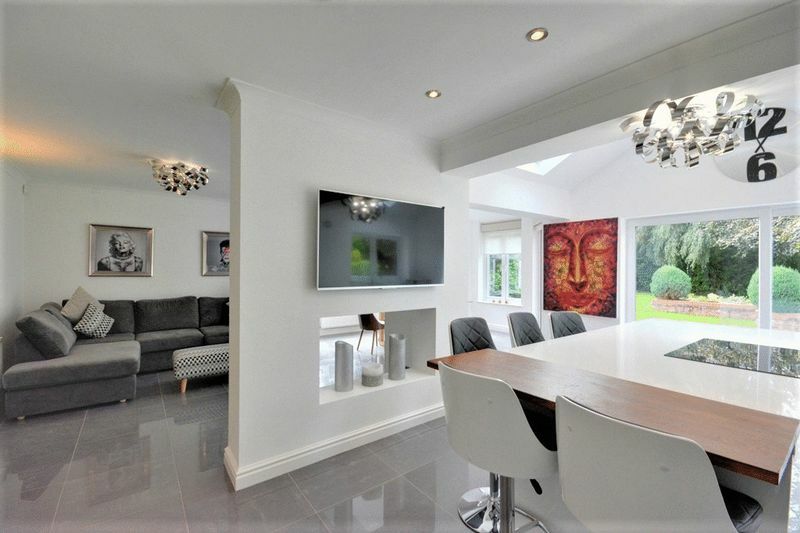 Spacious and bright second reception room with window to front, radiator to front, recessed spotligting to ceiling. 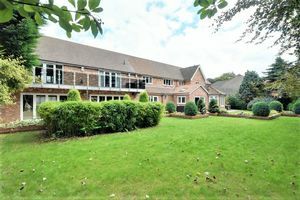 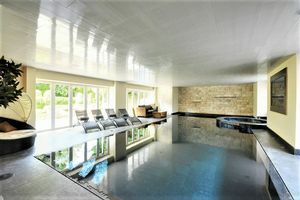 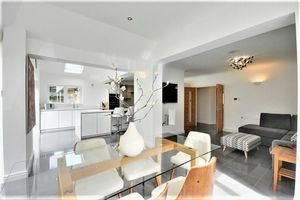 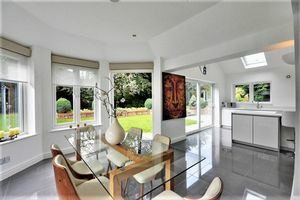 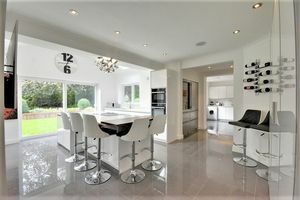 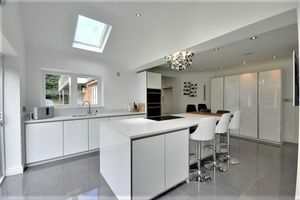 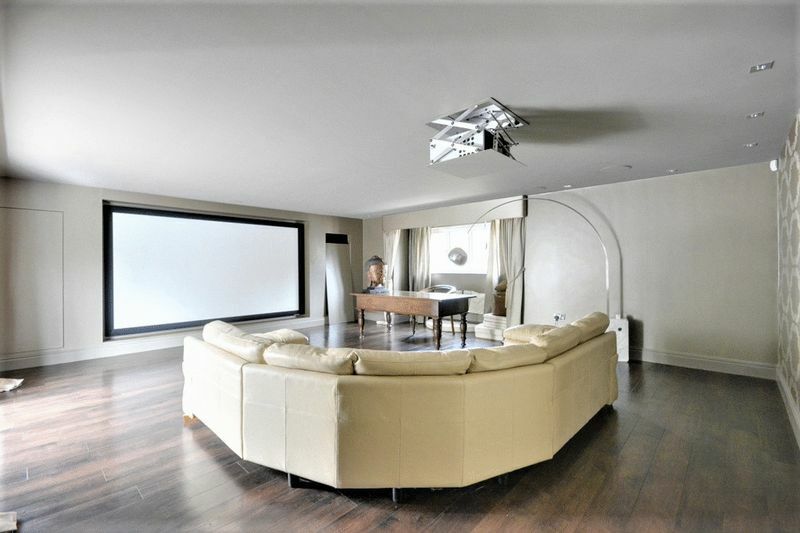 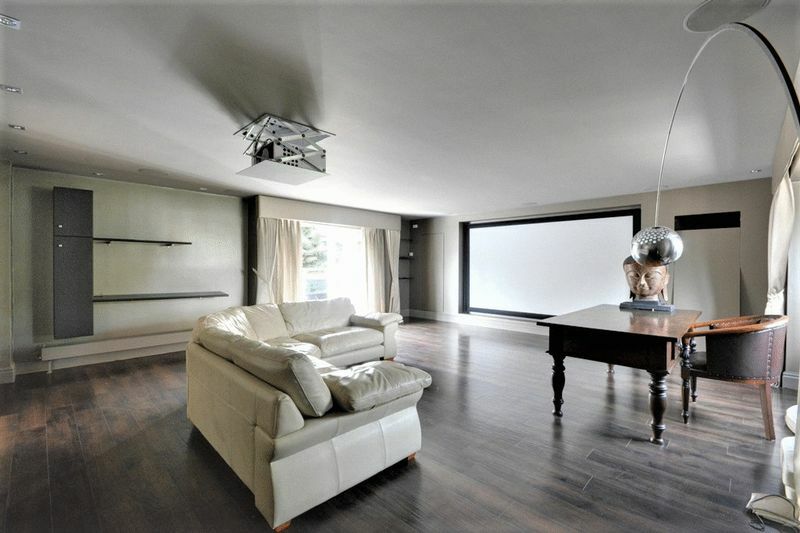 MEASURED TO FURTHEST POINT: modern, open plan living arrangement perfect for entertaining and day to day family living. 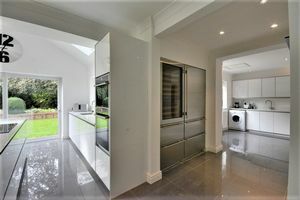 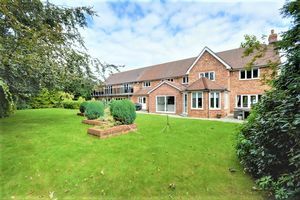 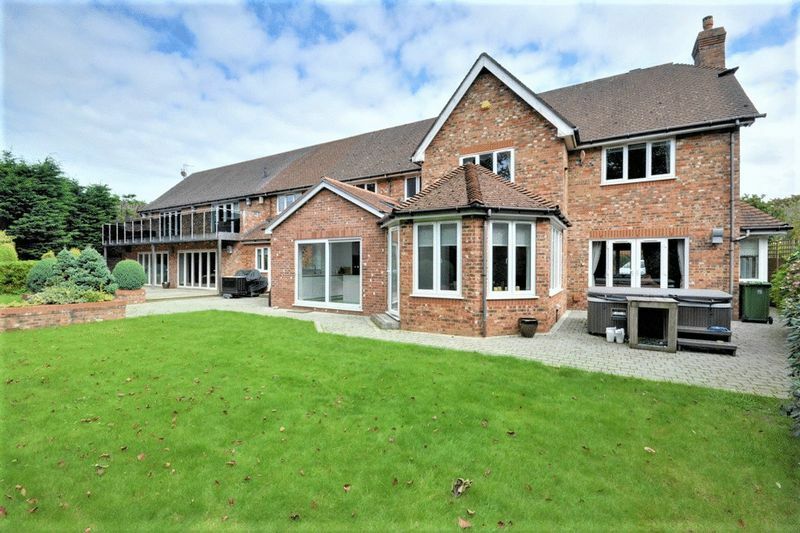 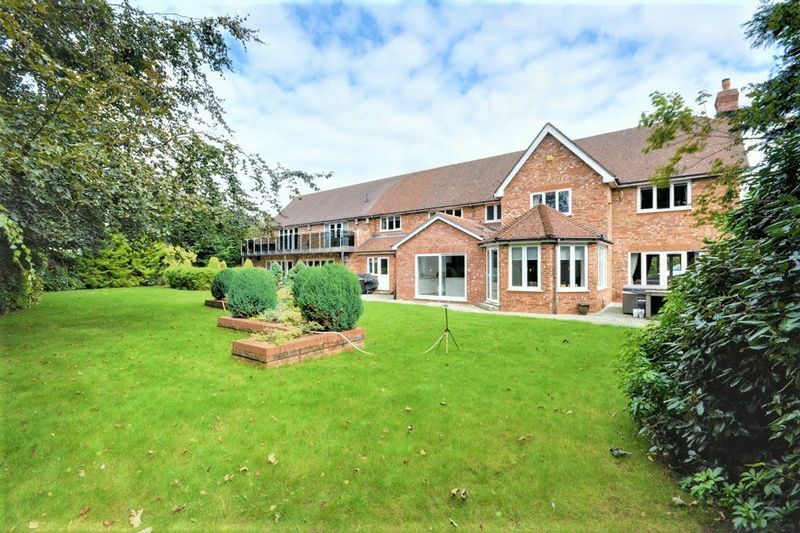 Comprising a high specification kitchen, dining room and sitting room, accessed via double oak doors off the entrance hall, open plan onto separate utility room. 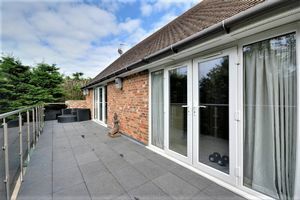 Tiled flooring, bay window off the dining area with double French doors, sliding patio doors off the kitchen and window to side, recessed spot lighting to ceiling. 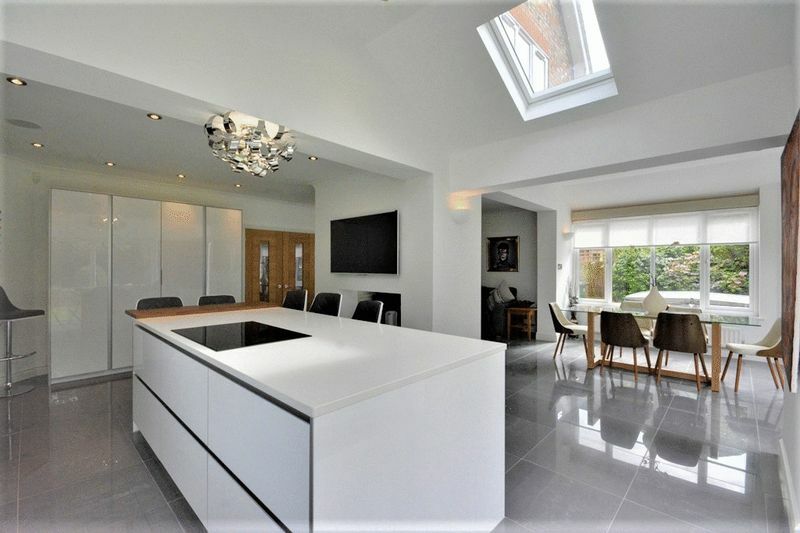 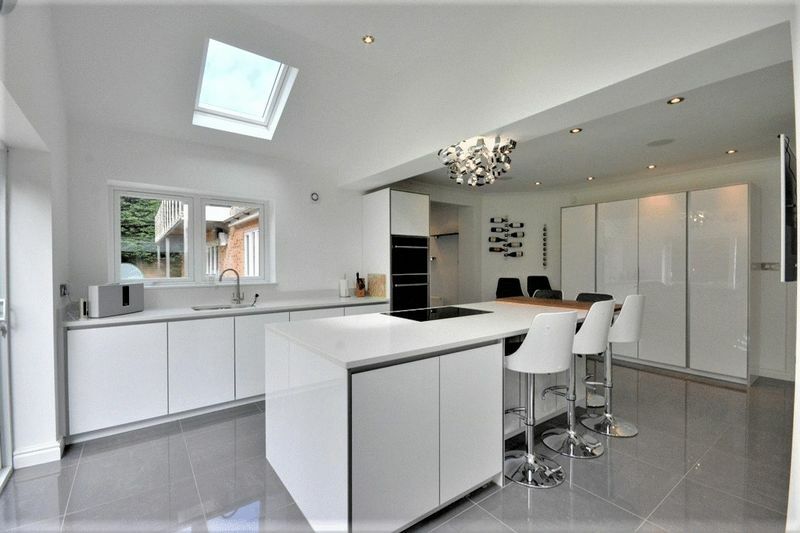 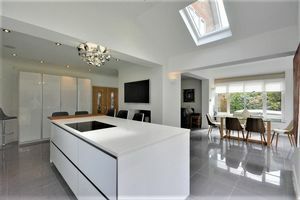 Modern fitted kitchen with white gloss units, complimentary work surfaces and matching kitchen island, integrated appliances including mixer sink, fridge/freezer, dishwasher, wine cooler, double oven and four ring induction hob. 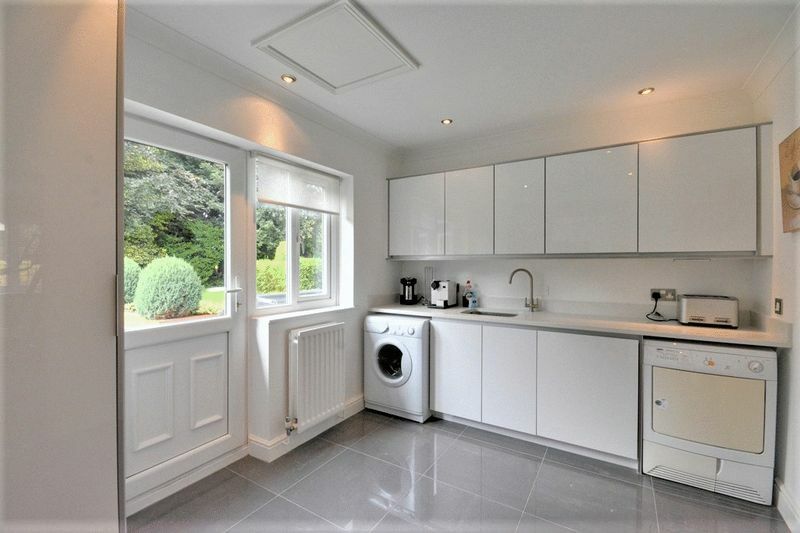 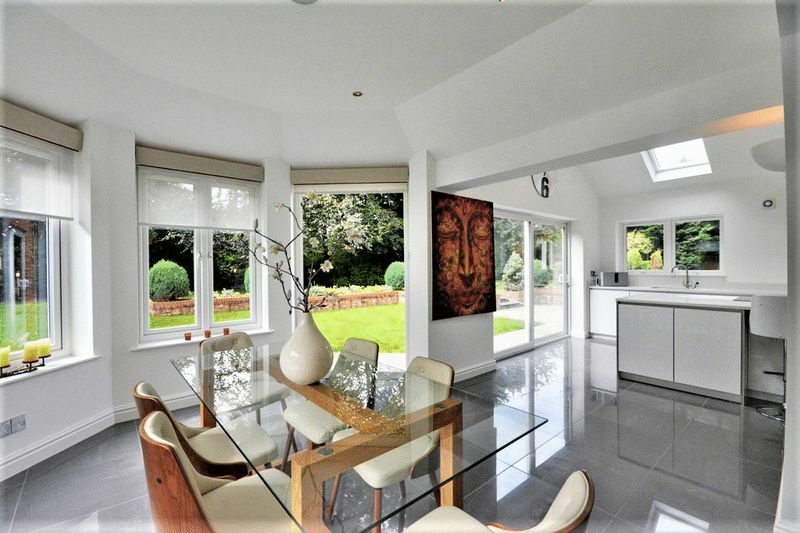 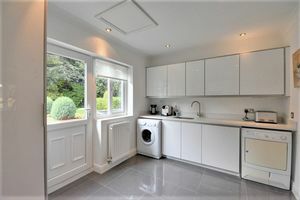 Window to rear, door to garden, radiator, tiled flooring, recessed spotlighting to ceiling, door to gymnasium and a matching range of base and eye level units with integrated mixer sink and space/plumbing for appliances. 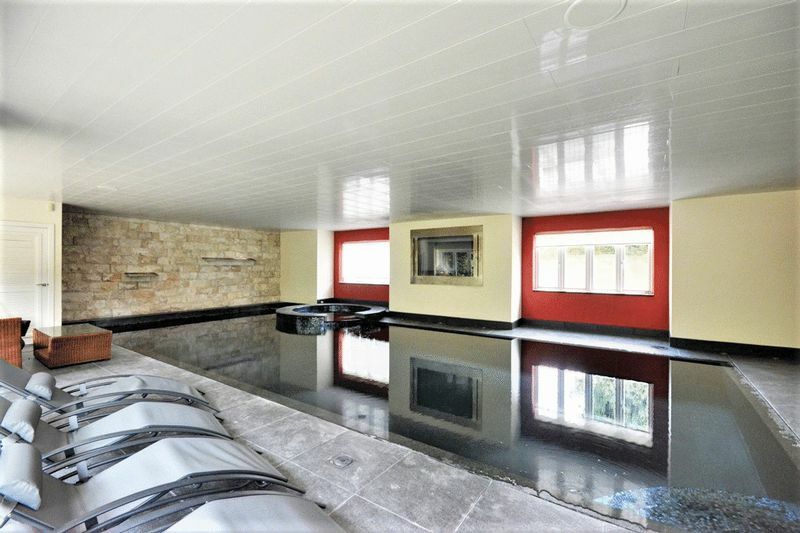 MEASURED TO FURTHEST POINT: Tiled flooring, door to WC, double doors to indoor swimming pool, recessed spotlighting to ceiling, window to front, radiator to front. 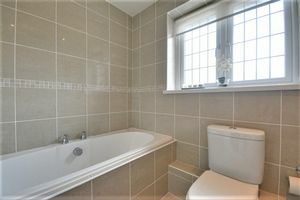 Tiled floor, partially tiled walls, two piece suite comprising pedestal wash hand basin and WC. 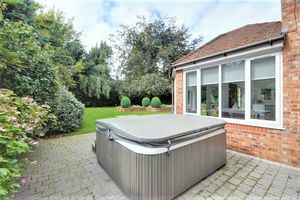 MEASURED TO FURTHEST POINT: Granite tiled deck level pool with integrated spa jacuzzi, waterfall features, plasma TV, two box windows to front, bi-folding doors to the length of the room onto raised timber decking patio seating area. 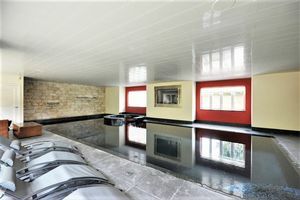 Pump room. 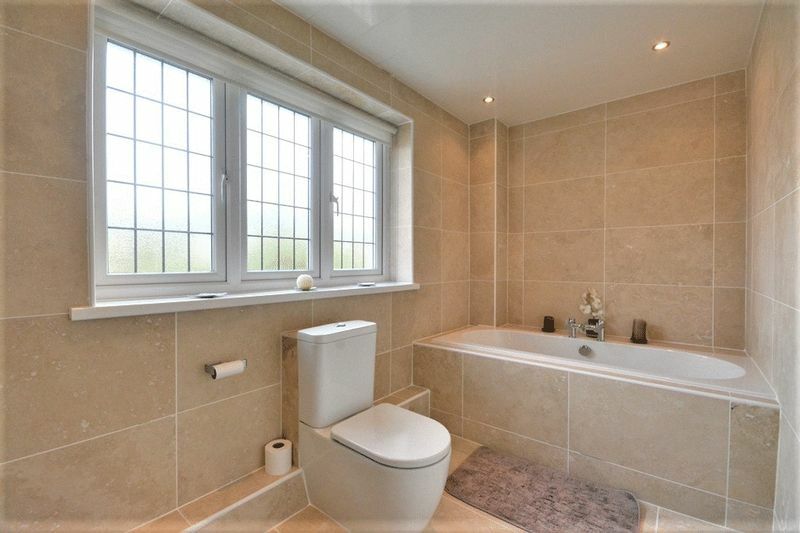 Karndean flooring, box window to front, double French doors onto balcony, electric blinds. 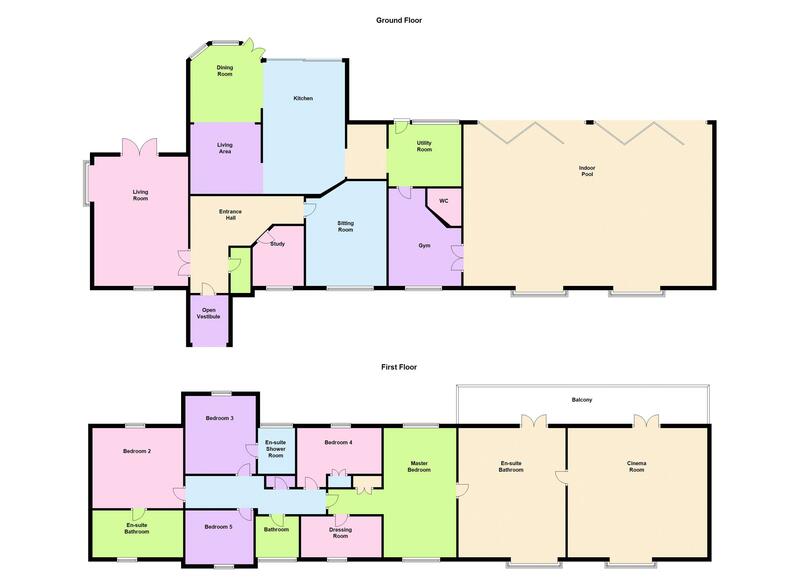 MEASURED TO SQUARE AREA: Karndean flooring, windows to front and rear, doors to dressing room and en suite bathroom, recessed spotlighting to ceiling. 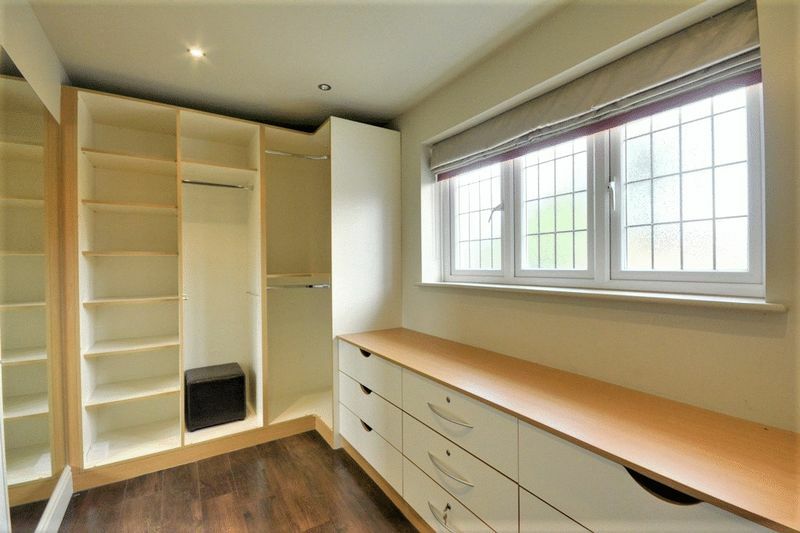 Walk in wardrobe/dressing room with window to front, karndean flooring, recessed spot lighting to ceiling and built in shelving and storage. Modern bathroom with box window to front, French doors onto balcony, door to cinema room, recessed spotlighting to ceiling, polished sandstone tiled walls, limestone tiled floor, hand built Roman bath, walk in 'Hansgrohe' shower with 'shower Heaven' system and 'Hansgrohe Raindance Rainfall' overhead shower, twin hand made limestone wash hand basins, heated towel rails and bidet. 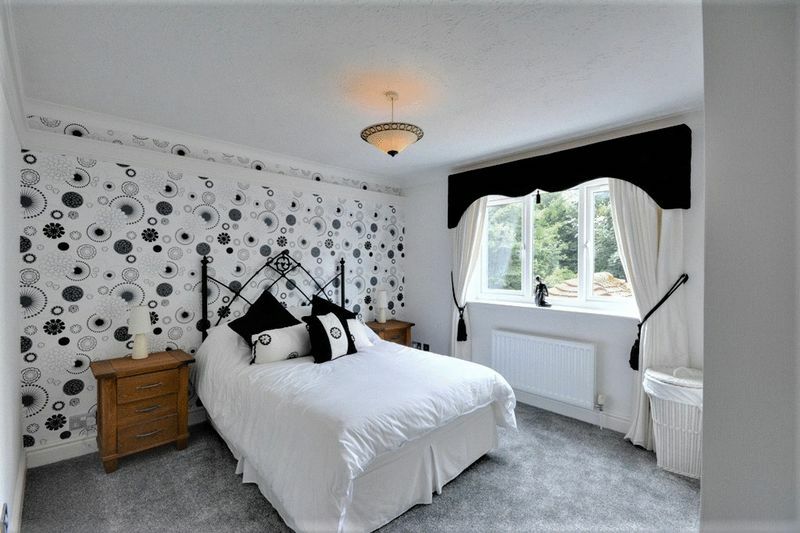 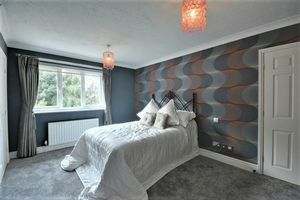 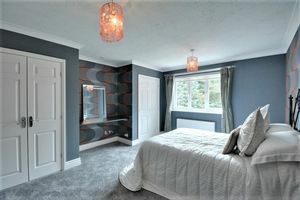 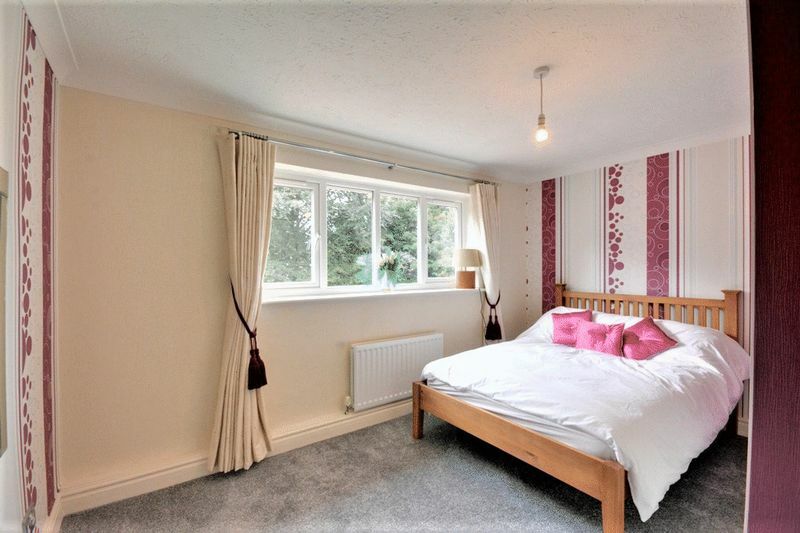 Bedroom with window to rear, door to en suite bathroom, radiator to rear fitted carpet and built in wardrobes. 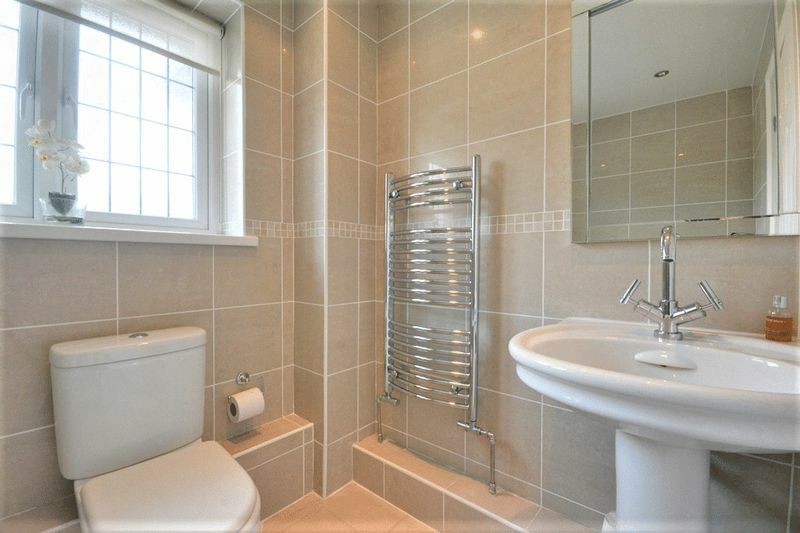 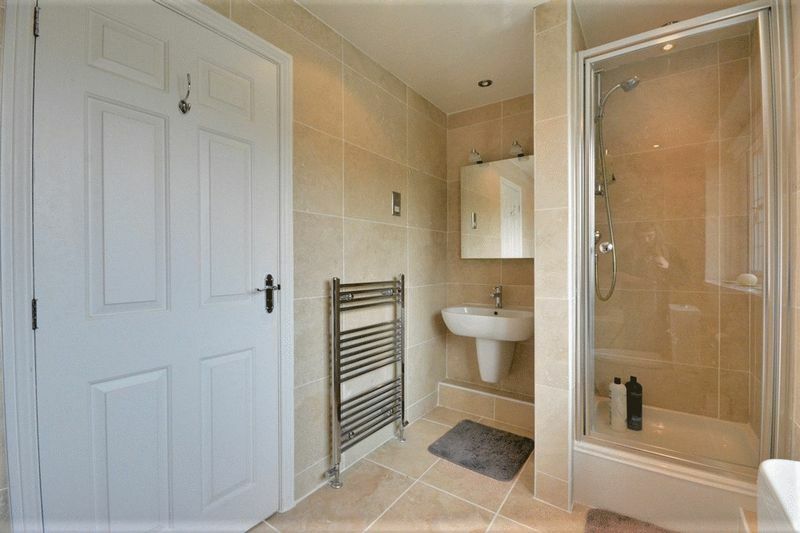 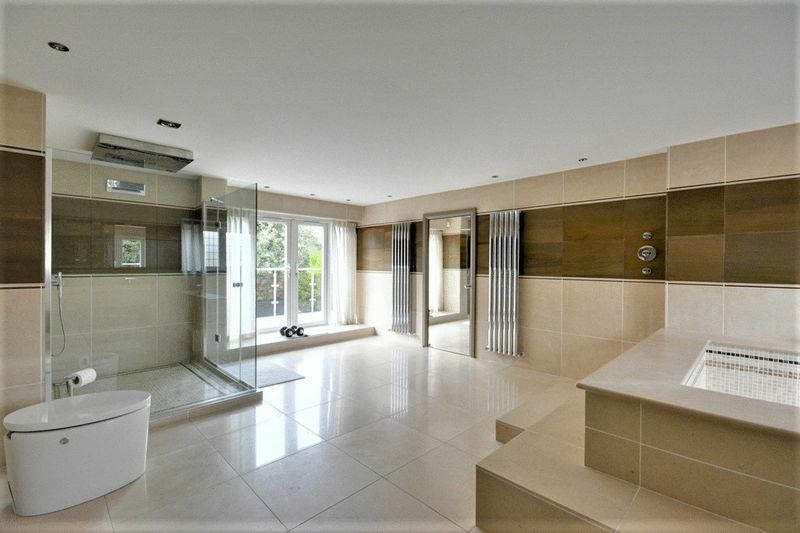 Modern bathroom with tiled walls and flooring, window to front, recessed spot lighting to ceiling, matching bathroom suite comprising tile sided bath, WC, wash hand basin, tiled shower compartment and heated towel rail. 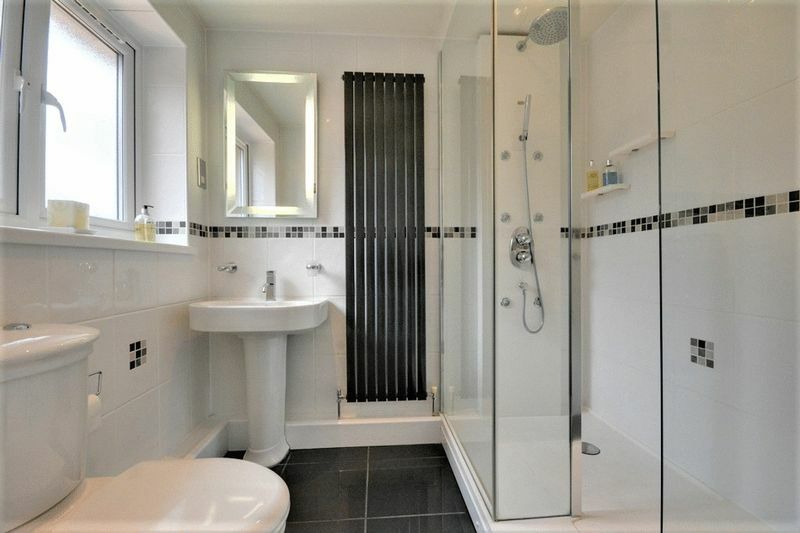 Window to rear, radiator to rear, fitted carpet, door to en suite. 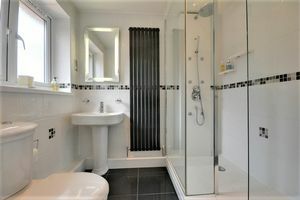 Shower room with window to rear, tiled walls and flooring, vertical radiator and three-piece suite comprising tiled shower compartment, wash hand basin and WC. Fitted carpet, window to rear, radiator to rear, integrated wardrobe. 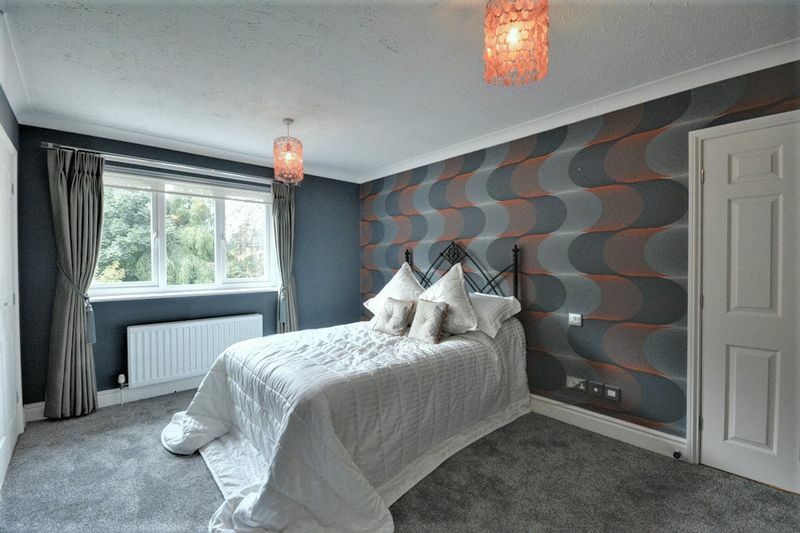 Window to front, radiator to front, fitted carpet. 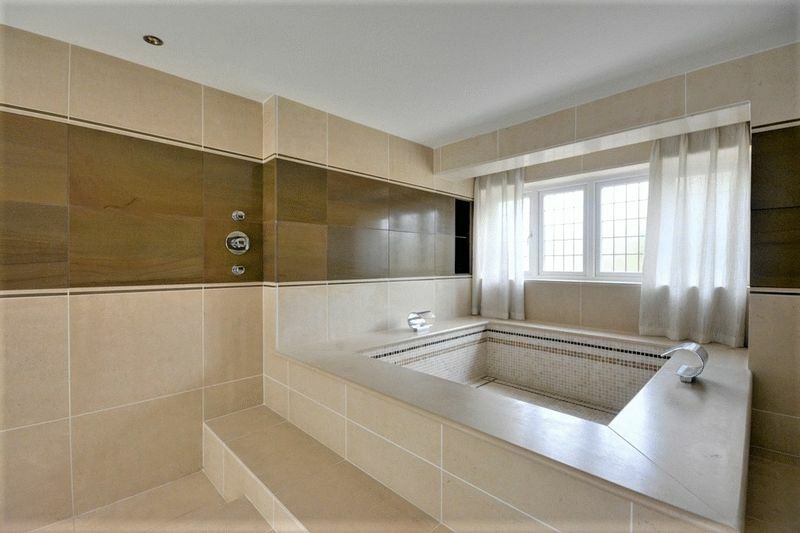 Bathroom with window to front, tiled walls and flooring, recessed spotlighting to ceiling, heated towel rail and three-piece suite comprising wash hand basin, WC and bath. Electric gates with secure intercom system, block paved driveway, decorative raised borders, paved garden area with water feature, detached double garage with up and over door. 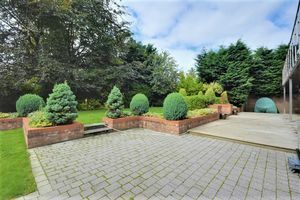 Landscaped rear garden with patio, lawn, raised brick borders and planters with trees, plants and flowering shrubbery, brick built fire pit, raised timber decking patio, bordered with established trees and shrubbery.